I absolutely love pasta. I could probably eat it for three meals a day and never tire of it. Unfortunately, pasta on its own isn't the most balanced meal. I set out to make a healthy vegan pasta dish that was packed with veggies, used gluten-free pasta, and also had protein. The result? 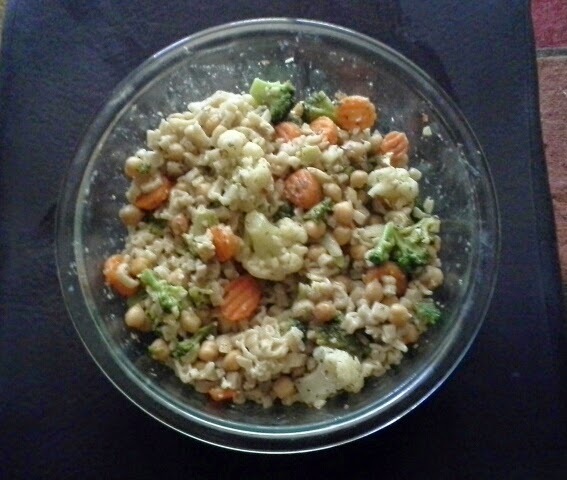 My Pasta and Chickpea Medley. Click the "Print Friendly" button below for a printable or PDF version. In a separate fry pan, pour in oil and veggies. Cover and place on low to medium low heat. Check periodically to ensure veggies aren't cooking too quickly. Continue to heat for about 10 minutes, or until pasta water is boiling. When pasta water is boiling, add pasta to water. While pasta is cooking, return to veggie pan. Add chickpeas, chopped almonds, and spices to pan. Stir to combine. Continue to cook at low heat for 10-15 minutes, stirring occasionally. If veggies are heated through and soft before pasta is done, remove from heat and keep covered. When pasta is al dente, drain pasta. Pour drained pasta into a large mixing bowl. Combine veggies with cooked pasta and toss gently to mix. This recipe makes about 4 generous servings. Consider serving with a side salad. For easy storage, I like to combine the pasta and veggies in a pyrex mixing bowl with a lid. Swap out ingredients to suit your tastes. Consider nuts such as pecans or walnuts; beans such as pinto or navy; and veggies such as green beans, zucchini, eggplant, or mushrooms. Potatoes can also be used, but tend to require longer cooking times.